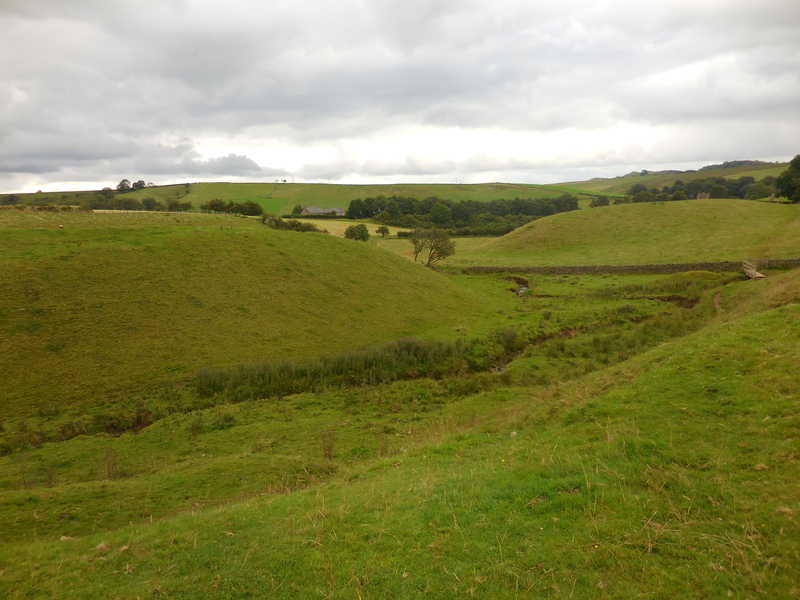 By now we had gotten used to following the Wall – or at least the line of the Wall – and set out from Gilsland over more fields. After a short while we met an American lady who was clearly exhausted even this early in the day, and she told us that we had the best – and the worst – to come. She was 69, she said, and if she had read the guidebook and looked at the map properly, she probably never would have come here. Then she shrugged and added: ‘But I did. And now I have. And I wouldn’t have missed it for the world, really.’ With this confusing message we kept walking in a landscape that was getting ever more uneven. 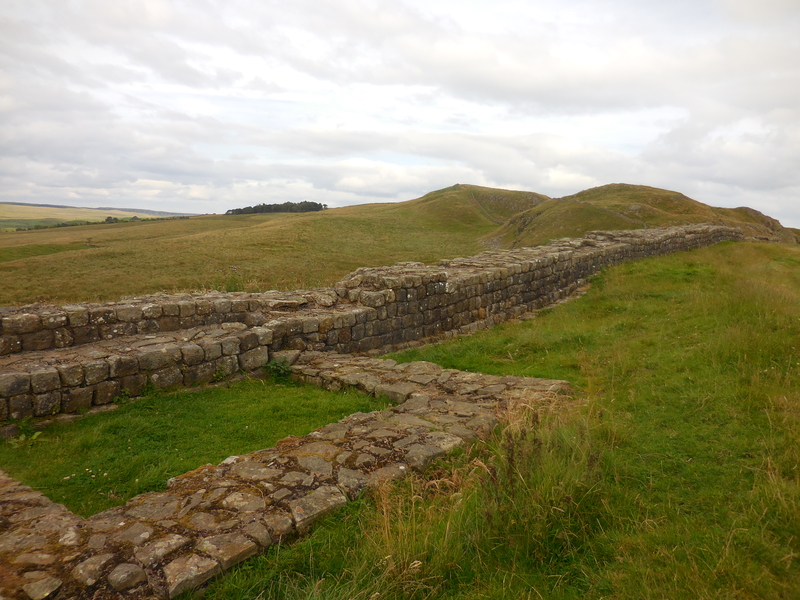 There were clear remnants of the vallum and ditch as well as large chunks of visible Wall. As we stood by the road getting our bearings, a car stopped and a charming lady from the area asked if she could help us. We showed her our guidebook with the hand drawn and detailed maps and she said: ‘Oh, you’ve got this one! I love this one. It’s so much more true to the path.’ OK, this was good news! She pointed us in the righ direction and said that after walking along the river for a bit, to not carry on too far. 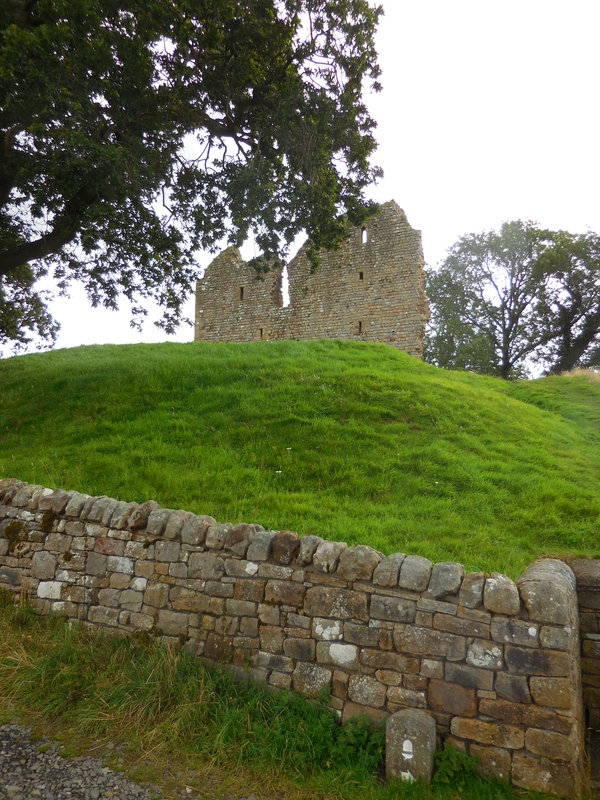 We saw what she meant when we suddenly saw the ruins of Thirlwall Castle (famous for looking good while in ruins) in front of us and a tiny acorn sign pointing us in the opposite direction (bottom right hand corner). We walked over the river and then we started going up. And up. And up, amongst the sheep. 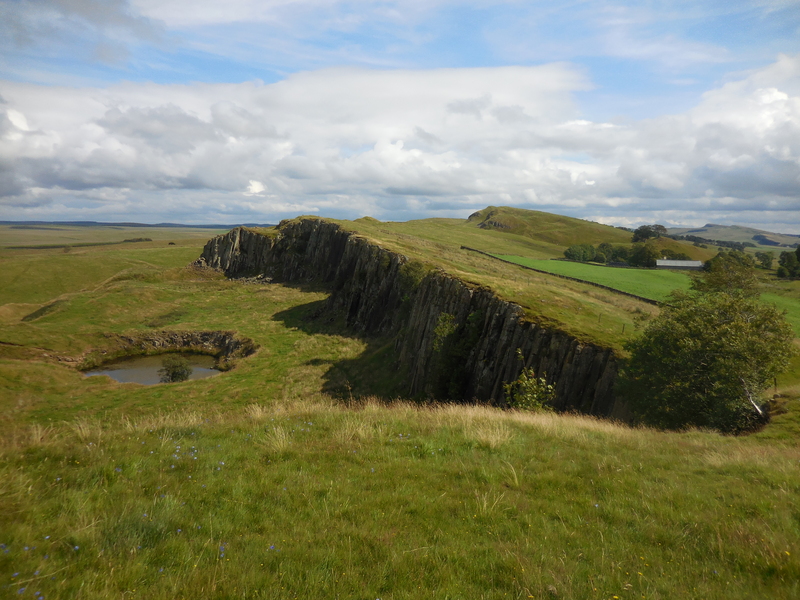 When we finally reached the top of the hill we saw this … Finally the famous crags, with the Wall snaking along the edge in an incredible feat of human engineering. Camera at the ready we powered up there and were rewarded with the kind of views we came here for. The sun even lit the scene. Breathtaking, and not just because of the steep hill. 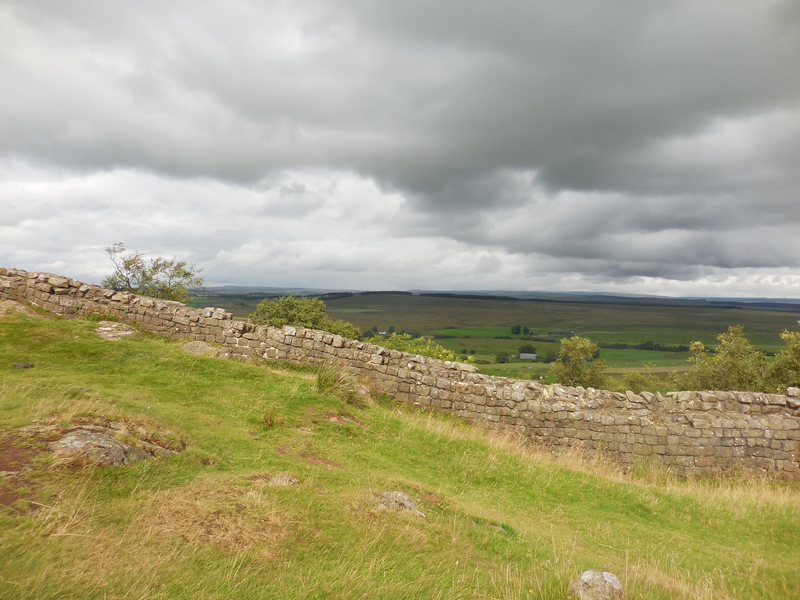 We stopped, turned, looked out over the landscape which was suddenly like a huge patchwork below us, our eyes trailing the wall behind and in front of us. 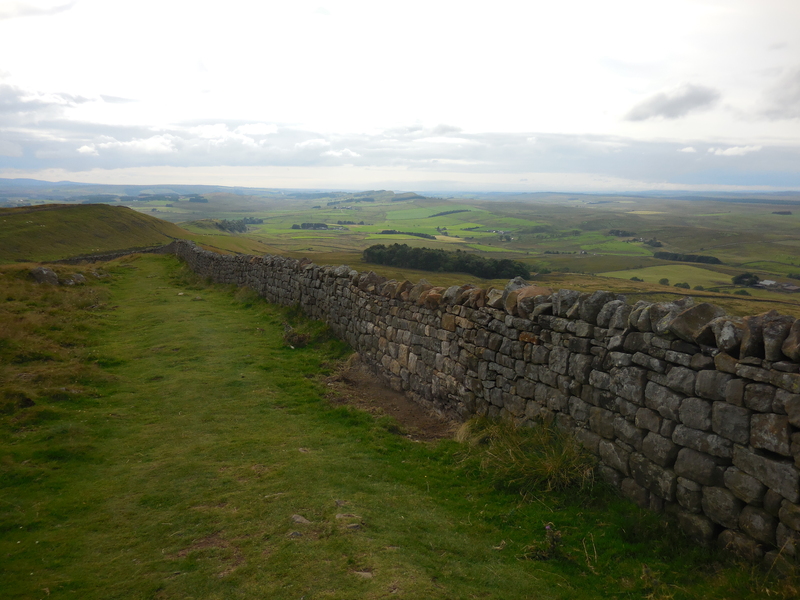 The wind kept us cool and it was a really comfortable and exhilarating walk up and down, on grass and paths and stepping stones laid along the wall. Wouldn’t like to think what it must be like in heavy rain, or after rain, it must be muddy and slippy. Our walking shoes served us very well though and it wasn’t too challenging, just a beautiful and ever changing walk with amazing views and perfect weather. 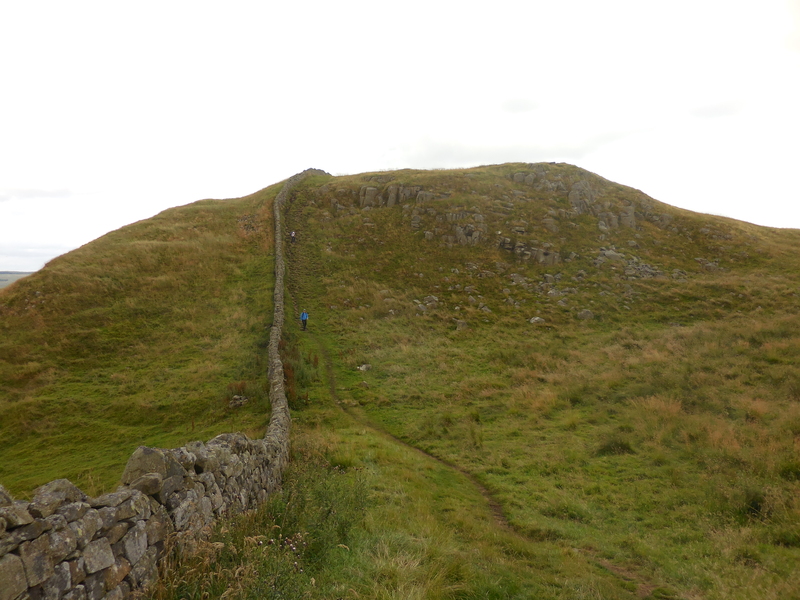 And beyond the one steep crag there was another, and beyond that another, in a row of steep cliffs stretching towards the East. We saw a few other walkers up there, but not many, and only one other Contrarian couple – all the others were Conformists walking from East to West. 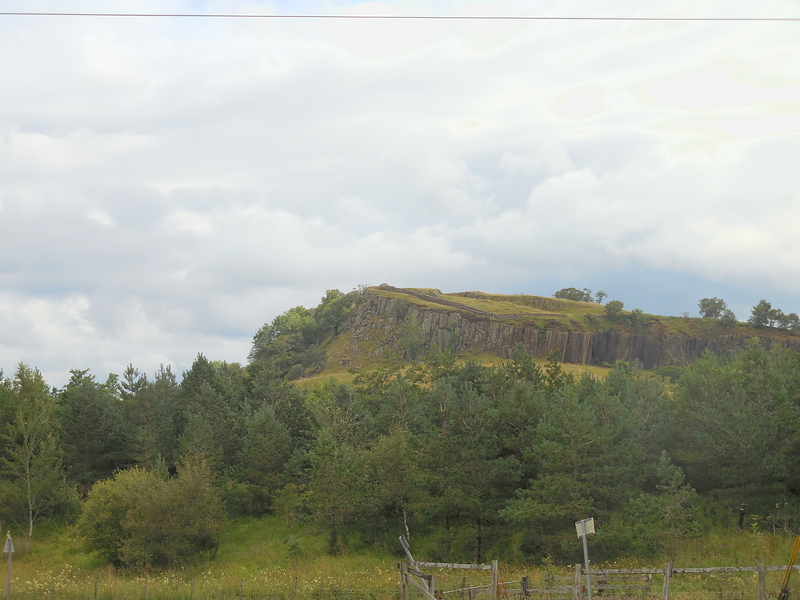 We asked if they had seen a café, pub, shop or something between the crags and our room for the night, but none had. 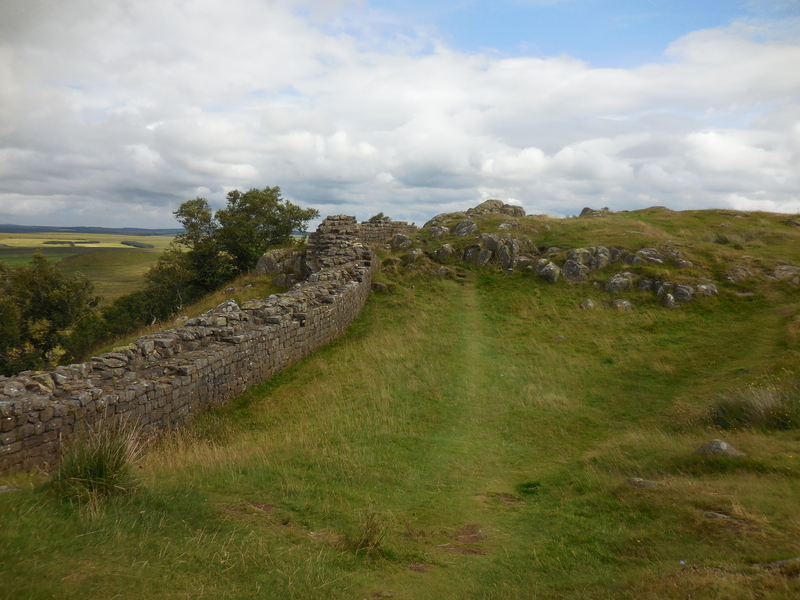 However, at a kissing gate by a B&B there was a poster for Milecastle Inn, and a confusing description of how to get there. We applied common sense and headed down the right hand road to get to the main road that runs parallel with the path and arrived five minutes later in a lovely watering hole with framed photos of That Tree on the walls and delicious sandwiches filled to the brim. After rolling my left foot on a cold can of cola I was ready to move on. 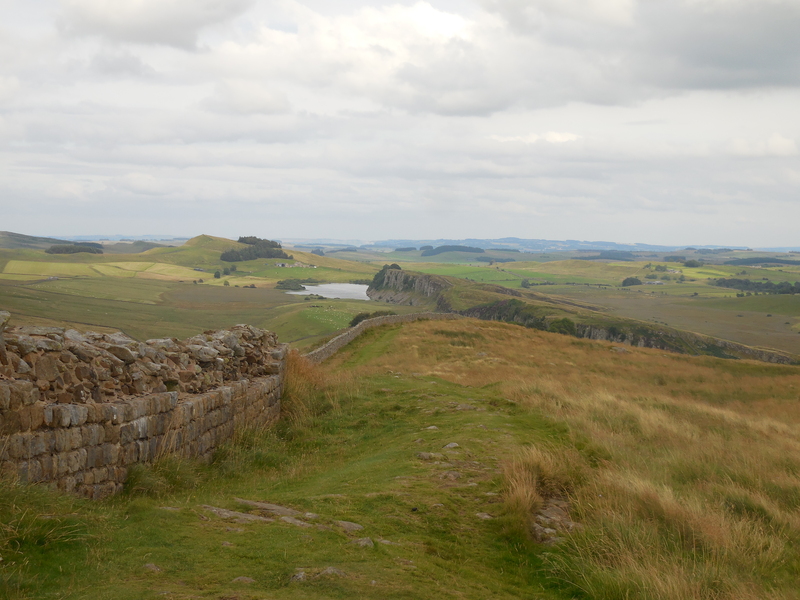 We even walked past the highest point on Hadrian’s Wall Path before we started on the descent to Once Brewed, so called because General Wade supposedly complained about the quality of the beer at the inn and demanded it was brewed again – hence the name of our home for the night, the Twice Brewed Inn. 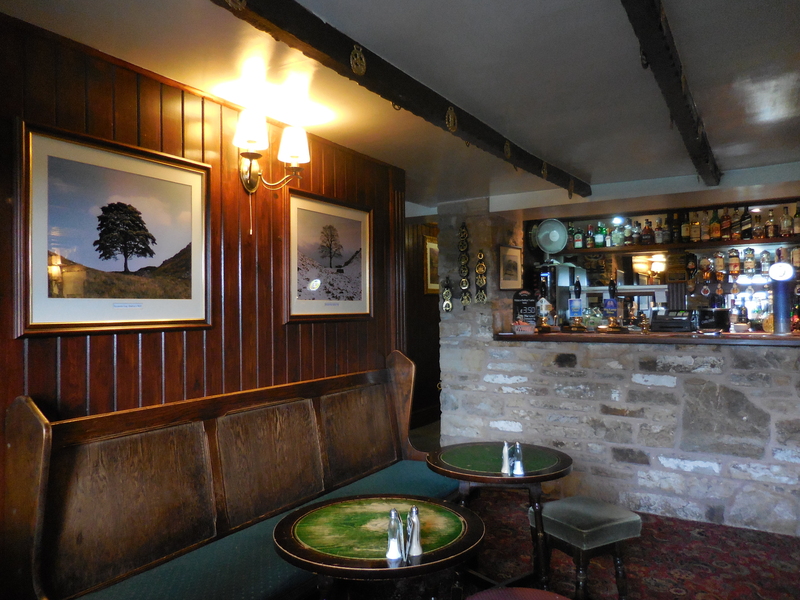 It had a cozy bar, a biggish restaurant and quite a few rooms and is a must-stop location for walkers on the HWP as well as the Pennine Way, which crosses the HWP near there. Again we had a lovely meal, though I chickened out from the chicken stuffed with haggis and port sauce, something I later regretted! Breakfast was cereals and fry-up again and we actually started getting a bit sick of bacon and eggs at this point. 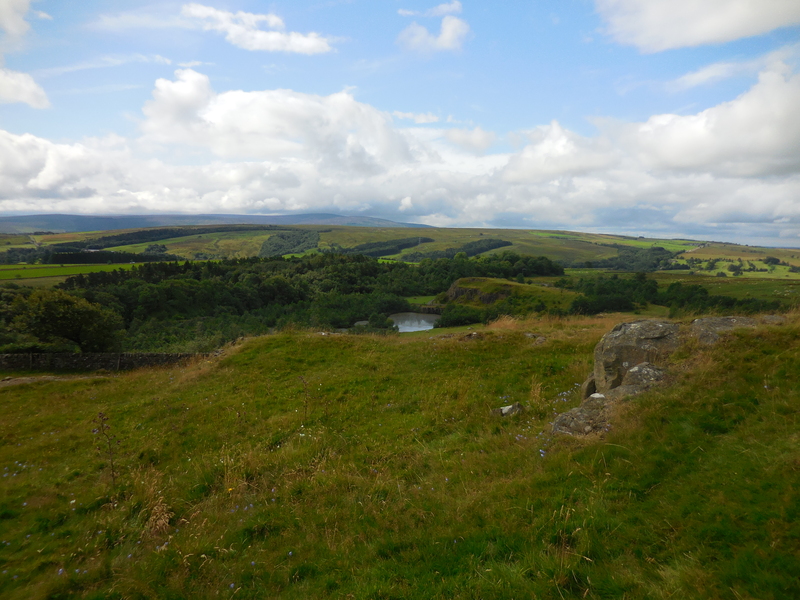 Thanks David – it’s easy when the landscape is so helpful! This was the best day, definitely, and I would go back and do it again anytime.